Looking for a Winter Wedding Venue In Raleigh? Are you planning a central North Carolina wedding that’s scheduled to take place during the deep winter months? If so, you may be searching for a reception spot that goes a step beyond the traditional (and somewhat boring) hotel conference room. But is it possible to find a spot that showcases the unique charm of our special southern city even when the temperatures suggest staying indoors would be better? Fortunately, yes it is! As Raleigh has grown, so have the options for hosting a one-of-a-kind party at any time of year. Whether your wedding personality is upscale chic, classic southern charm, or even garden beautiful, there’s a winter wedding venue to match and we’ve scouted out some of the best ones to help you in your search. Set among the beautiful rolling hills of North Raleigh, The Wakefield Barn is a restored dairy barn circa 1930 with plenty of charm and room for a large wedding. With both outdoor lawn and indoor space, it’s an ideal spot to let guests enjoy the scenic countryside, and is perfect if you want to incorporate heated tents with magical lighting and greenery for part of your event. 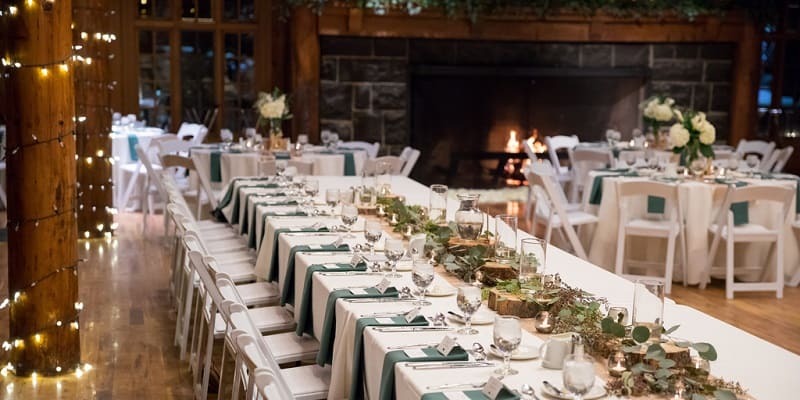 A bit closer to Raleigh is the Pavilion at Angus Barn, a gorgeous indoor/outdoor venue with rustic charm and plenty of history that can hold up to 400 people! Located at William B. Umstead State Park and part of the popular Angus Barn restaurant complex, it features timbers from Sherman’s March during the Civil War, original stones from Fayetteville Street, and lakefront views. An inside fireplace, outside firepit, and warm, cozy decor make it a perfect winter wedding spot. Looking out along downtown Raleigh’s iconic Fayetteville Street, The Stockroom at 230 offers a cool urban-historic vibe with exposed brick walls, latticed ceiling, and beautiful hardwood floors. A fixture in downtown since 1902, the large open space offers plenty of windows to bring in bright winter light and expansive views of the urban streetscape. The large open room accommodates nearly any arrangement of chairs, tables, and dance floor for both your ceremony and reception. With breathtaking views of the entire Raleigh skyline from atop the Wells Fargo Building in downtown Raleigh, City Club Raleigh is an elegant choice for an upscale wedding experience. Part of the Club Corp family, City Club is on the 28th floor, where guests can enjoy gorgeous views, made prettier by the occasional snowfall glistening across the treetops. For true southern charm, consider The Merrimon-Wynne House, on Blount Street in the heart of downtown Raleigh. This beautiful historic home was built in 1896 and restored in 2014 and offers a grand porch, huge floor to ceiling windows, and beautiful inside and outside space for ceremony and reception. The Rand-Bryan House is just outside Raleigh in the bedroom community of Garner. Dating to 1871, the house has been in the same family for generations. The land was originally a 3,000 acre granted to William Rand from the King of England in the late 1700’s! This Greek Revival home hosts indoor and outdoor wedding festivities for up to 250 guests, with plenty of locations on the property and a gorgeous landscape infused with plenty of traditional southern plantings. Nestled in North Carolina’s signature pines and the site of many a celebrity and amateur golf tournament, Prestonwood Country Club in Cary offers more than your traditional ballroom. With both outside and inside space that can accommodate seating for up to 350 guests, sweeping staircases, and plenty of floor to ceiling windows, a wedding reception here is perfect no matter the time of year. For more quintessential southern charm, how about Brier Creek Country Club in North Raleigh? It’s beautiful clubhouse has tons of windows looking out on an Arnold Palmer Signature Golf Course. Ample indoor and adjacent outdoor space that can be enjoyed and even if the weather is chilly when heated tenting is added to the mix. No matter what venue you choose for your Raleigh winter wedding, be sure to contact J&J Tent & Party Rentals at 919-977-3691 or connect with us through our Wedding Booking Page. We’ve been around a long time and know the venues well so we can help you out with the perfect table, chair, and tent options and work with the venues to make your day absolutely seamless!